"Native Canadian" redirects here. For Canadian-born people in general, see Canadians. Indigenous peoples in Canada, also known as Aboriginal Canadians (French: Canadiens Autochtones), are the indigenous peoples within the boundaries of Canada. They comprise the First Nations, Inuit and Métis. Although "Indian" is a term still commonly used in legal documents, the descriptors "Indian" and "Eskimo" have somewhat fallen into disuse in Canada and some consider them to be pejorative. Similarly, "Aboriginal" as a collective noun is a specific term of art used in some legal documents, including the Constitution Act, 1982, though in some circles that word is also falling into disfavour. Old Crow Flats and Bluefish Caves are some of the earliest known sites of human habitation in Canada. The Paleo-Indian Clovis, Plano and Pre-Dorset cultures pre-date current indigenous peoples of the Americas. Projectile point tools, spears, pottery, bangles, chisels and scrapers mark archaeological sites, thus distinguishing cultural periods, traditions and lithic reduction styles. In Section Thirty-five of the Constitution Act, 1982, "Aboriginal peoples of Canada" includes the Indian, Inuit and Métis peoples. Aboriginal peoples is a legal term encompassing all indigenous Canadian groups. Aboriginal peoples is beginning to be considered outdated and slowly being replaced by the term Indigenous peoples. First Nations (most often used in the plural) has come into general use since the 1970s replacing "Indians" in everyday vocabulary. However, on reserves, First Nations is being supplanted by members of various nations referring to themselves by their group or ethnical identity. In conversation this would be "I am Haida", or "we are Kwantlens", in recognition of their First Nations ethnicities. The Indian Act (R.S.C., 1985, c. I-5) sets the legal term Indian and "means a person who pursuant to this Act is registered as an Indian or is entitled to be registered as an Indian". Section 5 of this act states that a registry shall be maintained "in which shall be recorded the name of every person who is entitled to be registered as an Indian under this Act". No other term is legally recognized for the purpose of registration and the term Indian specifically excludes reference to Inuit as per section 4 of the Indian Act (R.S.C., 1985, c. I-5). Indian remains in place as the legal term used in the Canadian Constitution. Its usage outside such situations can be considered offensive. The term Eskimo has pejorative connotations in Canada and Greenland. Indigenous peoples in those areas have replaced the term Eskimo with Inuit. The Yupik of Alaska and Siberia do not consider themselves Inuit, and ethnographers agree they are a distinct people. They prefer the terminology Yupik, Yupiit, or Eskimo. The Yupik languages are linguistically distinct from the Inuit languages. Linguistic groups of Arctic people have no universal replacement term for Eskimo, inclusive of all Inuit and Yupik people across the geographical area inhabited by the Inuit and Yupik peoples. Besides these ethnic descriptors, Aboriginal peoples are often divided into legal categories based on their relationship with the Crown (i.e. the state). Section 91 (clause 24) of the Constitution Act, 1867 gives the federal government (as opposed to the provinces) the sole responsibility for "Indians, and Lands reserved for the Indians". The government inherited treaty obligations from the British colonial authorities in Eastern Canada and signed treaties itself with First Nations in Western Canada (the Numbered Treaties). It also passed the Indian Act in 1876 which governed its interactions with all treaty and non-treaty peoples. Members of First Nations bands that are subject to the Indian Act with the Crown are compiled on a list called the Indian Register, and such people are called Status Indians. Many non-treaty First Nations and all Inuit and Métis peoples are not subject to the Indian Act. However, two court cases have clarified that Inuit, Métis, and non-status First Nations people, all are covered by the term "Indians" in the Constitution Act, 1867. The first was Re Eskimos in 1939 covering the Inuit, the second being Daniels v. Canada in 2013 which applies to Métis and non-Status First Nations. Notwithstanding Canada's location within the Americas, the term "Native American" is not used in Canada as it is typically used solely to describe the indigenous peoples within the boundaries of the present-day United States. According to archaeological and genetic evidence, North and South America were the last continents in the world with human habitation. 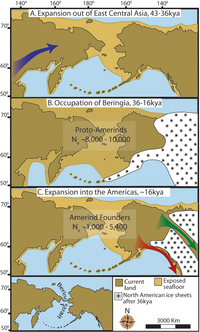 During the Wisconsin glaciation, 50,000–17,000 years ago, falling sea levels allowed people to move across the Bering land bridge that joined Siberia to north west North America (Alaska). Alaska was ice-free because of low snowfall, allowing a small population to exist. The Laurentide ice sheet covered most of Canada, blocking nomadic inhabitants and confining them to Alaska (East Beringia) for thousands of years. Aboriginal genetic studies suggest that the first inhabitants of the Americas share a single ancestral population, one that developed in isolation, conjectured to be Beringia. The isolation of these peoples in Beringia might have lasted 10,000–20,000 years. Around 16,500 years ago, the glaciers began melting, allowing people to move south and east into Canada and beyond. The first inhabitants of North America arrived in Canada at least 14,000 years ago. It is believed the inhabitants entered the Americas pursuing Pleistocene mammals such as the giant beaver, steppe wisent, musk ox, mastodons, woolly mammoths and ancient reindeer (early caribou). One route hypothesized is that people walked south by way of an ice-free corridor on the east side of the Rocky Mountains, and then fanned out across North America before continuing on to South America. The other conjectured route is that they migrated, either on foot or using primitive boats, down the Pacific Coast to the tip of South America, and then crossed the Rockies and Andes. Evidence of the latter has been covered by a sea level rise of hundreds of metres following the last ice age. The Old Crow Flats and basin was one of the areas in Canada untouched by glaciations during the Pleistocene Ice ages, thus it served as a pathway and refuge for ice age plants and animals. The area holds evidence of early human habitation in Canada dating from about 12,000. Fossils from the area include some never accounted for in North America, such as hyenas and large camels. Bluefish Caves is an archaeological site in Yukon, Canada from which a specimen of apparently human-worked mammoth bone has been radiocarbon dated to 12,000 years ago. Clovis sites dated at 13,500 years ago were discovered in western North America during the 1930s. Clovis peoples were regarded as the first widespread Paleo-Indian inhabitants of the New World and ancestors to all indigenous peoples in the Americas. Archaeological discoveries in the past thirty years have brought forward other distinctive knapping cultures who occupied the Americas from the lower Great Plains to the shores of Chile. Localized regional cultures developed from the time of the Younger Dryas cold climate period from 12,900 to 11,500 years ago. 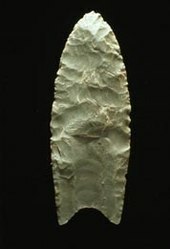 The Folsom tradition are characterized by their use of Folsom points as projectile tips at archaeological sites. These tools assisted activities at kill sites that marked the slaughter and butchering of bison. The land bridge existed until 13,000–11,000 years ago, long after the oldest proven human settlements in the New World began. Lower sea levels in the Queen Charlotte sound and Hecate Strait produced great grass lands called archipelago of Haida Gwaii. Hunter-gatherers of the area left distinctive lithic technology tools and the remains of large butchered mammals, occupying the area from 13,000–9,000 years ago. In July 1992, the Federal Government officially designated X̲á:ytem (near Mission, British Columbia) as a National Historic Site, one of the first Indigenous spiritual sites in Canada to be formally recognized in this manner. The Plano cultures was a group of hunter-gatherer communities that occupied the Great Plains area of North America between 12,000–10,000 years ago. The Paleo-Indians moved into new territory as it emerged from under the glaciers. Big game flourished in this new environment. The Plano culture are characterized by a range of projectile point tools collectively called Plano points, which were used to hunt bison. Their diets also included pronghorn, elk, deer, raccoon and coyote. At the beginning of the Archaic Era, they began to adopt a sedentary approach to subsistence. Sites in and around Belmont, Nova Scotia have evidence of Plano-Indians, indicating small seasonal hunting camps, perhaps re-visited over generations from around 11,000–10,000 years ago. Seasonal large and smaller game fish and fowl were food and raw material sources. Adaptation to the harsh environment included tailored clothing and skin-covered tents on wooden frames. The North American climate stabilized by 8000 BCE (10,000 years ago); climatic conditions were very similar to today's. This led to widespread migration, cultivation and later a dramatic rise in population all over the Americas. Over the course of thousands of years, American indigenous peoples domesticated, bred and cultivated a large array of plant species. These species now constitute 50–60% of all crops in cultivation worldwide. The vastness and variety of Canada's climates, ecology, vegetation, fauna, and landform separations have defined ancient peoples implicitly into cultural or linguistic divisions. Canada is surrounded north, east, and west with coastline and since the last ice age, Canada has consisted of distinct forest regions. Language contributes to the identity of a people by influencing social life ways and spiritual practices. Aboriginal religions developed from anthropomorphism and animism philosophies. The placement of artifacts and materials within an Archaic burial site indicated social differentiation based upon status. There is a continuous record of occupation of S'ólh Téméxw by Aboriginal people dating from the early Holocene period, 10,000–9,000 years ago. Archaeological sites at Stave Lake, Coquitlam Lake, Fort Langley and region uncovered early period artifacts. These early inhabitants were highly mobile hunter-gatherers, consisting of about 20 to 50 members of an extended family. [verification needed] The Na-Dene people occupied much of the land area of northwest and central North America starting around 8,000 BCE. They were the earliest ancestors of the Athabaskan-speaking peoples, including the Navajo and Apache. They had villages with large multi-family dwellings, used seasonally during the summer, from which they hunted, fished and gathered food supplies for the winter. The Wendat peoples settled into Southern Ontario along the Eramosa River around 8,000–7,000 BCE (10,000–9,000 years ago). They were concentrated between Lake Simcoe and Georgian Bay. Wendat hunted caribou to survive on the glacier-covered land. Many different First Nations cultures relied upon the buffalo starting by 6,000–5,000 BCE (8,000–7,000 years ago). They hunted buffalo by herding migrating buffalo off cliffs. Head-Smashed-In Buffalo Jump, near Lethbridge, Alberta, is a hunting grounds that was in use for about 5,000 years. The west coast of Canada by 7,000–5000 BCE (9,000–7,000 years ago) saw various cultures who organized themselves around salmon fishing. The Nuu-chah-nulth of Vancouver Island began whaling with advanced long spears at about this time. The Maritime Archaic is one group of North America's Archaic culture of sea-mammal hunters in the subarctic. They prospered from approximately 7,000 BCE–1,500 BCE (9,000–3,500 years ago) along the Atlantic Coast of North America. Their settlements included longhouses and boat-topped temporary or seasonal houses. They engaged in long-distance trade, using as currency white chert, a rock quarried from northern Labrador to Maine. The Pre-Columbian culture, whose members were called Red Paint People, is indigenous to the New England and Atlantic Canada regions of North America. The culture flourished between 3,000 BCE – 1,000 BCE (5,000–3,000 years ago) and was named after their burial ceremonies, which used large quantities of red ochre to cover bodies and grave goods. The Old Copper Complex societies dating from 3,000 BCE – 500 BCE (5,000–2,500 years ago) are a manifestation of the Woodland Culture, and are pre-pottery in nature. Evidence found in the northern Great Lakes regions indicates that they extracted copper from local glacial deposits and used it in its natural form to manufacture tools and implements. The Woodland cultural period dates from about 2,000 BCE – 1,000 CE, and has locales in Ontario, Quebec, and Maritime regions. The introduction of pottery distinguishes the Woodland culture from the earlier Archaic stage inhabitants. Laurentian people of southern Ontario manufactured the oldest pottery excavated to date in Canada. They created pointed-bottom beakers decorated by a cord marking technique that involved impressing tooth implements into wet clay. Woodland technology included items such as beaver incisor knives, bangles, and chisels. The population practising sedentary agricultural life ways continued to increase on a diet of squash, corn, and bean crops. 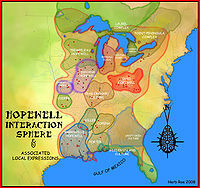 The Hopewell tradition is an Aboriginal culture that flourished along American rivers from 300 BCE – 500 CE. At its greatest extent, the Hopewell Exchange System networked cultures and societies with the peoples on the Canadian shores of Lake Ontario. Canadian expression of the Hopewellian peoples encompasses the Point Peninsula, Saugeen, and Laurel complexes. First Nations peoples had settled and established trade routes across what is now Canada by 500 BCE – 1,000 CE. Communities developed each with its own culture, customs, and character. In the northwest were the Athapaskan, Slavey, Dogrib, Tutchone, and Tlingit. Along the Pacific coast were the Tsimshian; Haida; Salish; Kwakiutl; Heiltsuk; Nootka; Nisga'a; Senakw and Gitxsan. In the plains were the Blackfoot; Káínawa; Sarcee and Peigan. In the northern woodlands were the Cree and Chipewyan. Around the Great Lakes were the Anishinaabe; Algonquin; Iroquois and Huron. Along the Atlantic coast were the Beothuk, Maliseet, Innu, Abenaki and Mi'kmaq. Many Aboriginal civilizations established characteristics and hallmarks that included permanent urban settlements or cities, agriculture, civic and monumental architecture, and complex societal hierarchies. These cultures had evolved and changed by the time of the first permanent European arrivals (c. late 15th–early 16th centuries), and have been brought forward through archaeological investigations. There are indications of contact made before Christopher Columbus between the first peoples and those from other continents. Aboriginal people in Canada interacted with Europeans around 1000 CE, but prolonged contact came after Europeans established permanent settlements in the 17th and 18th centuries. European written accounts generally recorded friendliness of the First Nations, who profited in trade with Europeans. Such trade generally strengthened the more organized political entities such as the Iroquois Confederation. Throughout the 16th century, European fleets made almost annual visits to the eastern shores of Canada to cultivate the fishing opportunities. A sideline industry emerged in the un-organized traffic of furs overseen by the Indian Department. Prominent First Nations people include Joe Capilano, who met with King of the United Kingdom, Edward VII, to speak of the need to settle land claims and Ovide Mercredi, a leader at both the Meech Lake Accord constitutional reform discussions and Oka Crisis. The Inuit are the descendants of what anthropologists call the Thule culture, which emerged from western Alaska around 1,000 CE and spread eastward across the Arctic, displacing the Dorset culture (in Inuktitut, the Tuniit). Inuit historically referred to the Tuniit as "giants", or "dwarfs", who were taller and stronger than the Inuit. Researchers hypothesize that the Dorset culture lacked dogs, larger weapons and other technologies used by the expanding Inuit society. By 1300, the Inuit had settled in west Greenland, and finally moved into east Greenland over the following century. The Inuit had trade routes with more southern cultures. Boundary disputes were common and led to aggressive actions. Warfare was common among Inuit groups with sufficient population density. Inuit, such as the Nunatamiut (Uummarmiut) who inhabited the Mackenzie River delta area, often engaged in common warfare. The Central Arctic Inuit lacked the population density to engage in warfare. In the 13th century, the Thule culture began arriving in Greenland from what is now Canada. Norse accounts are scant. Norse-made items from Inuit campsites in Greenland were obtained by either trade or plunder. One account, Ívar Bárðarson, speaks of "small people" with whom the Norsemen fought. 14th-century accounts relate that a western settlement, one of the two Norse settlements, was taken over by the Skræling. After the disappearance of the Norse colonies in Greenland, the Inuit had no contact with Europeans for at least a century. By the mid-16th century, Basque fishers were already working the Labrador coast and had established whaling stations on land, such as been excavated at Red Bay. The Inuit appear not to have interfered with their operations, but they did raid the stations in winter for tools, and particularly worked iron, which they adapted to native needs. Notable among the Inuit are Abraham Ulrikab and family who became a zoo exhibit in Hamburg, Germany, and Tanya Tagaq, a traditional throat singer. Abe Okpik was instrumental in helping Inuit obtain surnames rather than disc numbers and Kiviaq (David Ward) won the legal right to use his single-word Inuktituk name. The Métis are people descended from marriages between Europeans (mainly French) and Cree, Ojibway, Algonquin, Saulteaux, Menominee, Mi'kmaq, Maliseet, and other First Nations. Their history dates to the mid-17th century. When Europeans first arrived to Canada they relied on Aboriginal peoples for fur trading skills and survival. To ensure alliances, relationships between European fur traders and Aboriginal women were often consolidated through marriage. The Métis homeland consists of the Canadian provinces of British Columbia, Alberta, Saskatchewan, Manitoba, Quebec, New Brunswick, Nova Scotia, and Ontario, as well as the Northwest Territories (NWT). 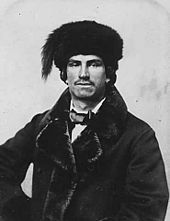 Amongst notable Métis people are singer and actor Tom Jackson, Commissioner of the Northwest Territories Tony Whitford, and Louis Riel who led two resistance movements: the Red River Rebellion of 1869–1870 and the North-West Rebellion of 1885, which ended in his trial and subsequent execution. The languages inherently Métis are either Métis French or a mixed language called Michif. Michif, Mechif or Métchif is a phonetic spelling of Métif, a variant of Métis. The Métis today predominantly speak English, with French a strong second language, as well as numerous Aboriginal tongues. A 19th-century community of the Métis people, the Anglo-Métis, were referred to as Countryborn. They were children of Rupert's Land fur trade typically of Orcadian, Scottish, or English paternal descent and Aboriginal maternal descent. Their first languages would have been Aboriginal (Cree, Saulteaux, Assiniboine, etc.) and English. Their fathers spoke Gaelic, thus leading to the development of an English dialect referred to as "Bungee". S.35 of the Constitution Act, 1982 mentions the Métis yet there has long been debate over legally defining the term Métis, but on September 23, 2003, the Supreme Court of Canada ruled that Métis are a distinct people with significant rights (Powley ruling). Unlike First Nations people, there has been no distinction between status and non-status Métis; the Métis, their heritage and Aboriginal ancestry have often been absorbed and assimilated into their surrounding populations. From the late 18th century, European Canadians (and the Canadian government) encouraged assimilation of Aboriginal culture into what was referred to as "Canadian culture". These attempts reached a climax in the late 19th and early 20th centuries, with a series of initiatives that aimed at complete assimilation and subjugation of the Aboriginal peoples. These policies, which were made possible by legislation such as the Gradual Civilization Act and the Indian Act, focused on European ideals of Christianity, sedentary living, agriculture, and education. Missionary work directed at the Aboriginal people of Canada had been ongoing since the first missionaries arrived in the 1600s, generally from France, someone of which were martyred (Jesuit saints called "The Canadian Martyrs"). Christianization as government policy became more systematic with the Indian Act in 1876, which would bring new sanctions for those who did not convert to Christianity. For example, the new laws would prevent non-Christian Aboriginal people from testifying or having their cases heard in court and ban alcohol consumption. 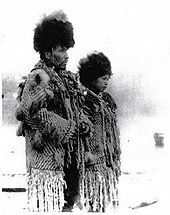 When the Indian Act was amended in 1884, traditional religious and social practices, such as the Potlatch, would be banned, and further amendments in 1920 would prevent "status Indians" (as defined in the Act) from wearing traditional dress or performing traditional dances in an attempt to stop all non-Christian practices. Another focus of the Canadian government was to make the Aboriginal groups of Canada sedentary, as they thought that this would make them easier to assimilate. In the 19th century, the government began to support the creation of model farming villages, which were meant to encourage non-sedentary Aboriginal groups to settle in an area and begin to cultivate agriculture. When most of these model farming villages failed, the government turned instead to the creation of Indian reserves with the Indian Act of 1876. With the creation of these reserves came many restricting laws, such as further bans on all intoxicants, restrictions on eligibility to vote in band elections, decreased hunting and fishing areas, and inability for status Indians to visit other groups on their reservations. Through the Gradual Civilization Act in 1857, the government would encourage Indians (i.e., First Nations) to enfranchise – to remove all legal distinctions between [Indians] and Her Majesty's other Canadian Subjects. If an Aboriginal chose to enfranchise, it would strip them and their family of Aboriginal title, with the idea that they would become "less savage" and "more civilized", thus become assimilated into Canadian society. However, they were often still defined as non-citizens by Europeans, and those few who did enfranchise were often met with disappointment. 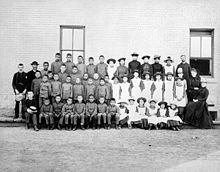 Of all the initiatives that were undertaken in the first century of Confederation, none was more ambitious or central to the civilizing strategy of the Department, to its goal of assimilation, than the residential school system… it was the residential school experience that would lead children most effectively out of their "savage" communities into "higher civilization" and "full citizenship." The Canadian Crown and Aboriginal peoples began interactions during the European colonialization period. Numbered treaties, the Indian Act, the Constitution Act of 1982 and case laws were established. Aboriginal peoples construe these agreements as being between them and the Crown of Canada through the districts Indian Agent, and not the Cabinet of Canada. The Māori interprets the Treaty of Waitangi in New Zealand similarly. A series of eleven treaties were signed between First Nations in Canada and the reigning Monarch of Canada from 1871 to 1921. The Government of Canada created the policy, commissioned the Treaty Commissioners and ratified the agreements. These Treaties are agreements with the Government of Canada administered by Canadian Aboriginal law and overseen by the Minister of Indian Affairs and Northern Development. According to the First Nations–Federal Crown Political Accord "cooperation will be a cornerstone for partnership between Canada and First Nations, wherein Canada is the short-form reference to Her Majesty the Queen in Right of Canada. The Supreme Court argued that treaties "served to reconcile pre-existing Aboriginal sovereignty with assumed Crown sovereignty, and to define Aboriginal rights". First Nations people interpreted agreements covered in treaty 8 to last "as long as the sun shines, grass grows and rivers flow." Former federal Indian affairs minister David Crombie was responsible for Bill C-31. The Indian Act is federal legislation that dates from 1876. There have been over 20 major changes made to the original Act since then, the last time being in 1951; amended in 1985 with Bill C-31. The Indian Act indicates how Reserves and Bands can operate and defines who is recognized as an "Indian". In 1985, the Canadian Parliament passed Bill C-31, "An Act to Amend the Indian Act". Because of a Constitutional requirement, the Bill took effect on April 17, 1985. It ends discriminatory provisions of the Indian Act, especially those that discriminated against women. It changes the meaning of "status" and for the first time allows for limited reinstatement of Indians who were denied or lost status and/or Band membership. It allows bands to define their own membership rules. Those people accepted into band membership under band rules may not be status Indians. C-31 clarified that various sections of the Indian Act would apply to band members. The sections under debate concern community life and land holdings. Sections pertaining to Indians (First Nations peoples) as individuals (in this case, wills and taxation of personal property) were not included. The Royal Commission on Aboriginal Peoples was a Royal Commission undertaken by the Government of Canada in 1991 to address issues of the Aboriginal peoples of Canada. It assessed past government policies toward Aboriginal people, such as residential schools, and provided policy recommendations to the government. The Commission issued its final report in November 1996. The five-volume, 4,000-page report covered a vast range of issues; its 440 recommendations called for sweeping changes to the interaction between Aboriginal, non-Aboriginal people and the governments in Canada. The report "set out a 20-year agenda for change." In 1995, the federal government announced the Aboriginal Right to Self-Government Policy. This policy recognizes that First Nations and Inuit have the constitutional right to shape their own forms of government to suit their particular historical, cultural, political and economic circumstances. The Indian Health Transfer Policy provided a framework for the assumption of control of health services by Aboriginal peoples, and set forth a developmental approach to transfer centred on self-determination in health. Through this process, the decision to enter transfer discussions with Health Canada rests with each community. Once involved in transfer, communities can take control of health programme responsibilities at a pace determined by their individual circumstances and health management capabilities. The National Aboriginal Health Organization (NAHO) incorporated in 2000, is an Aboriginal-designed and-controlled not-for-profit body in Canada that works to influence and advance the health and well-being of Aboriginal Peoples. First Nations and Inuit organizations ranged in size from band societies of a few people to multi-nation confederacies like the Iroquois. First Nations leaders from across the country formed the Assembly of First Nations, which began as the National Indian Brotherhood in 1968. The Métis and the Inuit are represented nationally by the Métis National Council and Inuit Tapiriit Kanatami respectively. Today's political organizations have resulted from interaction with European-style methods of government through the Federal Interlocutor for Métis and Non-Status Indians. Aboriginal political organizations throughout Canada vary in political standing, viewpoints, and reasons for forming. First Nations, Métis and Inuit negotiate with the Canadian Government through Indian and Northern Affairs Canada in all affairs concerning land, entitlement, and rights. The First Nation groups that operate independently do not belong to these groups. Countless North American Indigenous words, inventions and games have become an everyday part of Canadian language and use. The canoe, snowshoes, the toboggan, lacrosse, tug of war, maple syrup and tobacco are just a few of the products, inventions and games. Some of the words include the barbecue, caribou, chipmunk, woodchuck, hammock, skunk, and moose. Many places in Canada, both natural features and human habitations, use indigenous names. The word "Canada" itself derives from the St. Lawrence Iroquoian word meaning "village" or "settlement". The province of Saskatchewan derives its name from the Saskatchewan River, which in the Cree language is called "Kisiskatchewani Sipi", meaning "swift-flowing river." Canada's capital city Ottawa comes from the Algonquin language term "adawe" meaning "to trade." Modern youth groups such as Scouts Canada and the Girl Guides of Canada include programs based largely on Indigenous lore, arts and crafts, character building and outdoor camp craft and living. Aboriginal cultural areas depend upon their ancestors' primary lifeway, or occupation, at the time of European contact. These culture areas correspond closely with physical and ecological regions of Canada. The indigenous peoples of the Pacific Northwest Coast were centred around ocean and river fishing; in the interior of British Columbia, hunter-gatherer and river fishing. In both of these areas the salmon was of chief importance. For the people of the plains, bison hunting was the primary activity. In the subarctic forest, other species such as the moose were more important. For peoples near the Great Lakes and Saint Lawrence River, shifting agriculture was practised, including the raising of maize, beans, and squash. While for the Inuit, hunting was the primary source of food with seals the primary component of their diet. The caribou, fish, other marine mammals and to a lesser extent plants, berries and seaweed are part of the Inuit diet. One of the most noticeable symbols of Inuit culture, the inukshuk is the emblem of the Vancouver 2010 Winter Olympics. Inuksuit are rock sculptures made by stacking stones; in the shape of a human figure, they are called inunnguaq. Indian reserves, established in Canadian law by treaties such as Treaty 7, are lands of First Nations recognized by non-indigenous governments. Some reserves are within cities, such as the Opawikoscikan Reserve in Prince Albert, Saskatchewan, Wendake in Quebec City or Stony Plain 135 in the Edmonton Metropolitan Region. There are more reserves in Canada than there are First Nations, which were ceded multiple reserves by treaty. Aboriginal people currently work in a variety of occupations and may live outside their ancestral homes. The traditional cultures of their ancestors, shaped by nature, still exert a strong influence on them, from spirituality to political attitudes. National Aboriginal Day is a day of recognition of the cultures and contributions of the First Nations, Inuit and Métis peoples of Canada. The day was first celebrated in 1996, after it was proclaimed that year, by then Governor General of Canada Roméo LeBlanc, to be celebrated on June 21 annually. Most provincial jurisdictions do not recognize it as a statutory holiday. There are 13 Aboriginal language groups, 11 oral and 2 sign, in Canada, made up of more than 65 distinct dialects. Of these, only Cree, Inuktitut and Ojibway have a large enough population of fluent speakers to be considered viable to survive in the long term. Two of Canada's territories give official status to native languages. In Nunavut, Inuktitut and Inuinnaqtun are official languages alongside the national languages of English and French, and Inuktitut is a common vehicular language in territorial government. In the NWT, the Official Languages Act declares that there are eleven different languages: Chipewyan, Cree, English, French, Gwich’in, Inuinnaqtun, Inuktitut, Inuvialuktun, North Slavey, South Slavey and Tłįchǫ. Besides English and French, these languages are not vehicular in government; official status entitles citizens to receive services in them on request and to deal with the government in them. Source: Statistics Canada, 2006 Census Profile of Federal Electoral Districts (2003 Representation Order): Language, Mobility and Migration and Immigration and Citizenship Ottawa, 2007, pp. 2, 6, 10. Indigenous peoples were producing art for thousands of years before the arrival of European settler colonists and the eventual establishment of Canada as a nation state. Like the peoples who produced them, indigenous art traditions spanned territories across North America. Indigenous art traditions are organized by art historians according to cultural, linguistic or regional groups: Northwest Coast, Plateau, Plains, Eastern Woodlands, Subarctic, and Arctic. Art traditions vary enormously amongst and within these diverse groups. Indigenous art with a focus on portability and the body is distinguished from European traditions and its focus on architecture. Indigenous visual art may be used conjunction with other arts. Shamans' masks and rattles are used ceremoniously in dance, storytelling and music. Artworks preserved in museum collections date from the period after European contact and show evidence of the creative adoption and adaptation of European trade goods such as metal and glass beads. The distinct Métis cultures that have arisen from inter-cultural relationships with Europeans contribute culturally hybrid art forms. During the 19th and the first half of the 20th century the Canadian government pursued an active policy of forced and cultural assimilation toward indigenous peoples. The Indian Act banned manifestations of the Sun Dance, the Potlatch, and works of art depicting them. It was not until the 1950s and 1960s that indigenous artists such as Mungo Martin, Bill Reid and Norval Morrisseau began to publicly renew and re-invent indigenous art traditions. Currently there are indigenous artists practising in all media in Canada and two indigenous artists, Edward Poitras and Rebecca Belmore, have represented Canada at the Venice Biennale in 1995 and 2005 respectively. The Aboriginal peoples of Canada encompass diverse ethnic groups with their individual musical traditions. Music is usually social (public) or ceremonial (private). Public, social music may be dance music accompanied by rattles and drums. Private, ceremonial music includes vocal songs with accompaniment on percussion, used to mark occasions like Midewivin ceremonies and Sun Dances. Traditionally, Aboriginal peoples used the materials at hand to make their instruments for centuries before Europeans immigrated to Canada. First Nations people made gourds and animal horns into rattles, which were elaborately carved and brightly painted. In woodland areas, they made horns of birch bark and drumsticks of carved antlers and wood. Traditional percussion instruments such as drums were generally made of carved wood and animal hides. These musical instruments provide the background for songs, and songs the background for dances. Traditional First Nations people consider song and dance to be sacred. For years after Europeans came to Canada, First Nations people were forbidden to practice their ceremonies. People who self-identify as having Aboriginal ancestors are the plurality in large areas of Canada. 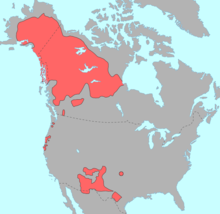 Areas coloured in brown have a North American Indian plurality, areas in magenta have an Inuit plurality. There are three (First Nations, Inuit and Métis) distinctive groups of North America indigenous peoples recognized in the Canadian Constitution Act, 1982, sections 25 and 35. Under the Employment Equity Act, Aboriginal people are a designated group along with women, visible minorities, and persons with disabilities. They are not a visible minority under the Employment Equity Act and in the view of Statistics Canada. The 2016 Canadian Census enumerated 1,673,780 Aboriginal people in Canada, 4.9% of the country's total population. This total includes 977,230 First Nations people, 587,545 Métis, and 65,025 Inuit. National representative bodies of Aboriginal people in Canada include the Assembly of First Nations, the Inuit Tapiriit Kanatami, the Métis National Council, the Native Women's Association of Canada, the National Association of Native Friendship Centres and the Congress of Aboriginal Peoples. In the 20th century the Aboriginal population of Canada increased tenfold. Between 1900 and 1950 the population grew by 29%. After the 1960s the infant mortality level on reserves dropped dramatically and the population grew by 161%. Since the 1980s the number of First Nations babies more than doubled and currently almost half of the First Nations population is under the age of 25. Indigenous people assert that their sovereign rights are valid, and point to the Royal Proclamation of 1763, which is mentioned in the Canadian Constitution Act, 1982, Section 25, the British North America Acts and the 1969 Vienna Convention on the Law of Treaties (to which Canada is a signatory) in support of this claim. B.^ According to Statistics Canada this figure "Includes those who identified themselves as Registered Indians and/or band members without identifying themselves as North American Indian, Métis or Inuit in the Aboriginal identity question." Across Canada, 56% of Indigenous peoples live in urban areas. The urban Indigenous population is the fastest-growing population segment in Canada. ^ a b Todorova, Miglena (2016). "Co-Created Learning: Decolonizing Journalism Education in Canada". Canadian Journal of Communication. 41: 673–692. ^ a b c "Civilization.ca-Gateway to Aboriginal Heritage-Culture". Canadian Museum of Civilization Corporation. Government of Canada. May 12, 2006. Archived from the original on October 20, 2009. Retrieved September 18, 2009. ^ a b "Inuit Circumpolar Council (Canada)-ICC Charter". Inuit Circumpolar Council > ICC Charter and By-laws > ICC Charter. 2007. Archived from the original on September 28, 2007. Retrieved September 18, 2009. ^ a b Todd, Thornton & Collins 2001, p. 10. ^ "Words First An Evolving Terminology Relating to Aboriginal Peoples in Canada". Communications Branch of Indian and Northern Affairs Canada. 2004. Archived from the original on November 14, 2007. Retrieved June 26, 2010. ^ a b "Terminology of First Nations, Native, Aboriginal and Metis" (PDF). Aboriginal Infant Development Programs of BC. 2009. Archived from the original (PDF) on July 14, 2010. Retrieved June 26, 2010. ^ a b c d Olson & Pappas 1994, p. 213. ^ "Native American, First Nations or Aboriginal? | Druide". www.druide.com. Retrieved May 19, 2017. ^ Darnell, Regna (2001). Invisible genealogies: a history of Americanist anthropology. Lincoln: University of Nebraska Press. p. 338. ISBN 978-0-8032-1710-2. Retrieved October 3, 2010. ^ Cameron, Rondo E (1993). A concise economic history of the world: from Paleolithic times to the present. Oxford University Press. p. 92. ISBN 978-0-19-507445-1. Retrieved October 3, 2010. ^ Kalman, Harold; Mills, Edward (September 30, 2007). "Architectural History: Early First Nations". The Canadian Encyclopedia (Historica-Dominion). Retrieved November 27, 2013. ^ Macklem, Patrick (2001). Indigenous difference and the Constitution of Canada. University of Toronto Press. p. 170. ISBN 978-0-8020-4195-1. Retrieved October 3, 2010. ^ a b "What to Search: Topics-Canadian Genealogy Centre-Library and Archives Canada". Ethno-Cultural and Aboriginal Groups. Government of Canada. May 27, 2009. Archived from the original on July 5, 2009. Retrieved October 2, 2009. ^ a b "Innu Culture 3. Innu-Inuit 'Warfare'". 1999, Adrian Tanner Department of Anthropology-Memorial University of Newfoundland. Retrieved October 5, 2009. ^ a b c "Civilization.ca-Gateway to Aboriginal Heritage-object". Canadian Museum of Civilization Corporation. May 12, 2006. Archived from the original on October 15, 2009. Retrieved October 2, 2009. ^ a b c "National Aboriginal Day History" (PDF). Indian and Northern Affairs Canada. Retrieved October 18, 2009. ^ "National Aboriginal Achievement Award Recipients". National Aboriginal Achievement Foundation. Archived from the original on October 11, 2009. Retrieved October 7, 2009. ^ a b "Constitution Act, 1982 Canadian Charter of Rights and Freedoms". Department of Justice. Government of Canada. 1982. Archived from the original on October 21, 2009. Retrieved October 5, 2009. ^ a b "Terminology of First Nations, Native, Aboriginal and Metis (NAHO)" (PDF). aidp.bc.ca/. Archived from the original (PDF) on July 14, 2010. Retrieved October 5, 2009. ^ a b "Terminology". Indian and Northern Affairs Canada. Archived from the original on October 27, 2009. Retrieved October 5, 2009. ^ Edwards, John (2009). Language and Identity (Digitized online by Google books). Cambridge University Press. ISBN 978-0-521-69602-9. Retrieved October 5, 2009. ^ a b Branch, Legislative Services. "Consolidated federal laws of canada, Indian Act". laws-lois.justice.gc.ca. Retrieved October 4, 2017. ^ Hirschfelder, Arlene B; Beamer, Yvonne (2002). Native Americans today: resources and activities for educators, grades 4–8. Teacher Ideas Press, 2000. p. 3. ISBN 978-1-56308-694-6. Retrieved January 11, 2015. ^ a b ""Eskimo" vs. "Inuit"". Expansionist Party of the United States. Archived from the original on October 13, 2007. Retrieved October 5, 2009. ^ "Court rules Metis, non-status Indians qualify as 'Indians' under Act". Archived from the original on January 8, 2013. Retrieved November 23, 2016. ^ "Native American". Oxford Advanced American Dictionary. Archived from the original on May 27, 2013. Retrieved May 27, 2013. In Canada, the term Native American is not used, and the most usual way to refer to the Aboriginal peoples of Canada, other than the Inuit and Métis, is First Nations. ^ "Atlas of the Human Journey-The Genographic Project". National Geographic Society. 1996–2008. Archived from the original on May 1, 2011. Retrieved October 6, 2009. ^ Goebel T, Waters MR, O'Rourke DH (2008). "The Late Pleistocene Dispersal of Modern Humans in the Americas" (PDF). Science. 319 (5869): 1497–502. Bibcode:2008Sci...319.1497G. doi:10.1126/science.1153569. PMID 18339930. ^ Wade, Nicholas (March 13, 2014). "Pause Is Seen in a Continent's Peopling". The New York Times. ^ Wells, Spencer; Read, Mark (2002). The Journey of Man – A Genetic Odyssey. Random House. pp. 138–140. ISBN 978-0-8129-7146-0. ^ Than, Ker (2008). "New World Settlers Took 20,000-Year Pit Stop". National Geographic Society. Retrieved January 23, 2010. ^ Sigurðardóttir, Sigrún; Helgason, Agnar; Gulcher, Jeffrey R.; Stefansson, Kári; Donnelly, Peter (May 2000). "The Mutation Rate in the Human mtDNA Control Region". American Journal of Human Genetics. 66 (5): 1599–1609. doi:10.1086/302902. PMC 1378010. PMID 10756141. ^ Tamm, Erika; Kivisild, Toomas; Reidla, Maere; et al. (September 5, 2007). "Beringian Standstill and Spread of Native American Founders". PLoS ONE. 2 (9): e829. Bibcode:2007PLoSO...2..829T. doi:10.1371/journal.pone.0000829. PMC 1952074. PMID 17786201. ^ Jordan, David K (2009). "Prehistoric Beringia". University of California-San Diego. Retrieved April 15, 2010. ^ Brian M. Fagan; Nadia Durrani (2016). World Prehistory: A Brief Introduction. Routledge. p. 124. ISBN 978-1-317-34244-1. ^ Gibbard, P.; van Kolfschoten, T. (2004). "Chapter 22: The Pleistocene and Holocene Epochs" (PDF). A Geologic Time Scale. Gowin Institute for Quaternary Research. Cambridge University Press, UK: Quaternary Palaeoenvironments Group, Department of Geography, University of Cambridge. ISBN 978-0-521-78142-8. ^ Merchant, Carolyn (2007). American environmental history: an introduction. Columbia University Press. p. 6. ISBN 978-0-231-14034-8. ^ Fladmark, K. R. (January 1979). "Alternate Migration Corridors for Early Man in North America". American Antiquity. 44 (1): 55–69. doi:10.2307/279189. JSTOR 279189. ^ "68 Responses to Sea will rise 'to levels of last Ice Age". Center for Climate Systems Research, Columbia University. Archived from the original on October 27, 2009. Retrieved October 6, 2009. ^ Harris, Ann G.; Tuttle, Esther; Tuttle, Sherwood D. (2004). Geology of National Parks. Kendall/Hunt Publishing Company. pp. 1–. ISBN 978-0-7872-9970-5. ^ "Life in Crow Flats-Part 1". Old Crow's official Website. Vuntut Gwitchin First Nation. 1998–2009. Retrieved September 18, 2009. ^ a b Cordell, Linda S.; Lightfoot, Kent; McManamon, Francis; Milner, George (2008). Archaeology in America: An Encyclopedia. 4. ABC-CLIO. p. 3. ISBN 978-0-313-02189-3. ^ "Old Crow Flats". taiga.net. Archived from the original on August 23, 2007. Retrieved August 5, 2007. ^ Lepper, Bradley T. (1999). "Pleistocene Peoples of Midcontinental North America". In Bonnichsen, Robson; Turnmire, Karen (eds.). Ice Age People of North America. Corvallis: Oregon State University Press. pp. 362–394. ISBN 978-0-87071-458-0. ^ Firestone, R. B.; West, A.; Kennett, J.P.; et al. (2007). Evidence for an extraterrestrial impact 12,900 years ago that contributed to the megafaunal extinctions and the Younger Dryas cooling. Proceedings of the National Academy of Sciences. 104. pp. 16016–16021. Bibcode:2007PNAS..10416016F. doi:10.1073/pnas.0706977104. ISBN 978-0-87071-458-0. PMC 1994902. PMID 17901202. ^ Kennett, D.J. ; Kennett, J.P.; West, A.; et al. (January 2009). "Nanodiamonds in the Younger Dryas boundary sediment layer". Science. 323 (5910): 94. Bibcode:2009Sci...323...94K. doi:10.1126/science.1162819. PMID 19119227. ^ Hillerman, Tony (June 1980). "The Hunt for the Lost American". The Great Taos Bank Robbery: And Other Indian Country Affairs. University of New Mexico Press. p. 52. ISBN 978-0-8263-0530-5. ^ Dyke, Arthur S.; Prest, Victor K. (1987). "Late Wisconsinan and Holocene History of the Laurentide Ice Sheet" (PDF). Géographie Physique et Quaternaire. 41 (2): 237–263. doi:10.7202/032681ar. ^ a b "Prehistory of Haida Gwaii". Civilization.ca-Haida-The people and the land-Prehistory. Canadian Museum of Civilization Corporation. June 8, 2001. ^ Jameson 1997, p. 159. ^ a b c d e Reynolds, Graham; MacKinnon, Richard; MacDonald, Ken. "Period 1 (10,000–8,000 years ago) Palaeo-Indian culture". Learners Portal. Folkus Atlantic Productions. Archived from the original on July 13, 2011. Retrieved September 18, 2009. ^ Taylor 2002, p. 10. ^ a b c Imbrie, J; K.P.Imbrie (1979). Ice Ages: Solving the Mystery. Short Hills NJ: Enslow Publishers. p. 135. ISBN 978-0-226-66811-6. Retrieved October 18, 2009. ^ United States. Foreign Agricultural Service (1962). Foreign agriculture. 24. United States: Bureau of Agricultural Economics. p. 167. ISBN 978-0-16-038463-9. ^ a b c Fagan, Brian M (1992). People of the Earth: An Introduction to World Prehistory. University of California. Harper Collins. ISBN 978-0-321-01457-3. ^ Friesen, John (1997). Rediscovering the First Nations of Canada. Calgary, AB: Detselig Enterprises Ltd. ISBN 978-1-55059-143-9. ^ a b Carlson, Keith Thor, ed. (1997). You Are Asked to Witness: The Stó:lō in Canada's Pacific Coast History. Chilliwack, BC: Stó:lō Heritage Trust. ISBN 978-0-9681577-0-1. ^ "American Indian Heritage Month: Commemoration vs. Exploitation". ABC-CLIO. Retrieved October 2, 2009. ^ Leer, Jeff; Doug Hitch; John Ritter (2001). Interior Tlingit noun dictionary: The dialects spoken by Tlingit elders of Carcross and Teslin, Yukon, and Atlin, British Columbia. Whitehorse, Yukon Territory: Yukon Native Language Centre. ISBN 978-1-55242-227-4. ^ a b c d e f Ray 1996. ^ Tuck, J. A. (1976). "Ancient peoples of Port au Choix". The excavation of an Archaic Indian Cemetery in Newfoundland. Newfoundland Social and Economic Studies 17. St. John's: Institute of Social and Economic Research. ISBN 978-0-919666-12-2. ^ "The so-called "Red Paint People". Brian Robinson. University of Maine. 1997. Archived from the original on January 14, 2010. Retrieved October 18, 2009. ^ a b c Fagan, Brian M. (2005). Ancient North America: The Archaeology of a Continent (4 ed.). New York: Thames & Hudson Inc. pp. 390, p396. ISBN 978-0-500-28148-2. ^ a b Winchell 1881, pp. 601–602. ^ "A History of the Native People of Canada". Dr. James V. Wright. Canadian Museum of Civilization. 2009. Retrieved October 9, 2009. ^ Ohio Historical Society (2009). "Hopewell Culture-Ohio History Central-A product of the Ohio Historical Society". Hopewell-Ohio History Central. Retrieved September 18, 2009. ^ Douglas T. Price; Gary M. Feinman (2008). Images of the Past, 5th edition. New York: McGraw-Hill. pp. 274–277. ISBN 978-0-07-340520-9. ^ Joe, Rita; Lesley Choyce (2005). The Native Canadian Anthology. Nimbus Publishing (CN). ISBN 978-1-895900-04-0. ^ "civilization - definition of civilization in English from the Oxford dictionary". Oxforddictionaries.com. Retrieved October 25, 2015. ^ Prine, Elizabeth (April 17, 2015). "Native American | indigenous peoples of Canada and United States". Britannica.com. Retrieved October 25, 2015. ^ Peter Turchin; Leonid Grinin; Andrey Korotayev; Victor C. de Munck.Turchin (2006). Moscow: KomKniga/URSS, 2006. (ed.). History and mathematics: Historical Dynamics and Development of Complex Societies (URSS.ru-Books on Science-On-line Bookstore.). ISBN 978-5-484-01002-8. Retrieved October 18, 2009. ^ Willey, Gordon R; Philip Phillips (1957). Method and Theory in American Archaeology. University of Chicago Press. pp. 1(introduction). ISBN 978-0-226-89888-9. Retrieved October 18, 2009. ^ a b George Woodcock (January 25, 1990). "Part 1". A Social History of Canada. Penguin Books Ltd. ISBN 978-0-14-010536-0. ^ A Narrow Vision: Duncan Campbell Scott and the Administration of Indian. By E. Brian Titley. Vancouver: University Of British Columbia Press. 1992. ISBN 978-0-7748-0420-2. ^ "Ovide Mercredi installed as chancellor of Manitoba's newest university". CBC News. November 7, 2007. Archived from the original on November 9, 2007. Retrieved October 3, 2009. ^ "The History of Metropolitan Vancouver's Hall of Fame Joe Capilano". Retrieved October 5, 2009. ^ Rigby, Bruce. "101. Qaummaarviit Historic Park, Nunavut Handbook" (PDF). Archived from the original (PDF) on May 29, 2006. Retrieved October 2, 2009. ^ "The Dorsets: Depicting Culture Through Soapstone Carving" (PDF). Archived from the original (PDF) on October 30, 2007. Retrieved October 5, 2009. ^ "Inuit Post-Contact History". Memorial University of Newfoundland and Labrador, Canada. Retrieved October 5, 2009. ^ Hans Christian Gulløv (2005). Grønlands Forhistorie. p. 17. ISBN 978-87-02-01724-3. ^ Fitzhugh, William W. (2000). Fitzhugh, William W.; Elisabeth I. Ward (eds.). Vikings: The North Atlantic Saga. Washington, D.C.: Smithsonian Institution. pp. 193–205. ISBN 978-1-56098-995-0. ^ McGhee, Robert (June – July 1992). Northern Approaches. Before Columbus: Early European Visitors to the New World. 3. The Beaver. Exploring Canada's History. p. 194. ISSN 0005-7517. ^ Kleivan, H (1966). The Eskimos of Northeast Labrador. 139. Norsk Polarinstitutt Skrifter. p. 9. OCLC 786916953. ^ Minogue, Sarah (September 23, 2005). "When Inuit become zoo curiosities "We sat there like pieces of art in a showcase on display"". Archived from the original on September 17, 2009. Retrieved October 6, 2009. ^ "Kiviaq versus Canada film by Zacharias Kunuk Produced by Katarina Soukup" (PDF). Isuma Distribution International Inc. 2006. Archived from the original (PDF) on December 14, 2010. Retrieved October 3, 2009. ^ Hanson, Ann Meekitjuk. "Nunavut 99-What's In A Name? Names, as well as events, mark the road to Nunavut". Nunavut.com. Retrieved October 3, 2009. ^ Rinella, Steven (2008). American Buffalo: In Search of A Lost Icon. NY: Spiegel and Grau. p. 166. ISBN 978-0-385-52168-0. Retrieved October 18, 2009. ^ Stevenson, Winona (2011). Racism, Colonization and Indigeneity in Canada. Ontario, Canada: Oxford University Press. pp. 44–45. ^ Howard, James H (1965). The Plains-Ojibwa or Bungi: hunters and warriors of the Northern Prairies with special reference to the Turtle Mountain band (Museum Anthropology Papers 1 ed.). University of South Dakota. ISBN 978-0-16-050400-6. ^ "Singer Tom Jackson pitches housing complex for Winnipeg". Canada: CBC. October 23, 2009. Archived from the original on October 25, 2009. Retrieved January 27, 2011. ^ Stanley, George F.G. (April 22, 2013). "Louis Riel". The Canadian Encyclopedia. revised by Adam Gaudry. Historica Canada. ^ "Louis Riel". A database of materials held by the University of Saskatchewan Libraries and the University Archives. Archived from the original on September 25, 2007. Retrieved September 23, 2007. ^ "Backgrounder Biography of Anthony W.J. (Tony) Whitford – NWT Commissioner". Indian and Northern Affairs Canada. 2005 News Releases. October 28, 2008. Archived from the original on June 13, 2011. Retrieved October 6, 2009. ^ The Problem of Michif. Peter Bakker-Metis Resource Centre. 1997. ISBN 978-0-19-509711-5. Archived from the original on July 6, 2011. Retrieved October 5, 2009. ^ Barkwell, Lawrence J.; Leah Dorion; Audreen Hourie (2006). Metis legacy Michif culture, heritage, and folkways. Metis legacy series, v. 2. Saskatoon, SK: Gabriel Dumont Institute. ISBN 978-0-920915-80-6. ^ "The Red River dialect". Blain, Eleanor M. (1994). Winnipeg: Wuerz Publishing. Archived from the original on March 15, 2008. Retrieved October 15, 2009. ^ Martha Harroun Foster (January 2006). We know who we are: Métis identity in a Montana community. University of Oklahoma Press. p. 12. ISBN 978-0-8061-3705-6. ^ "Her Majesty The Queen vs. Steve Powley and Roddy Charles Powley (R. v. Powley, 2 S.C.R. 207, 2003 SCC 43)" (PDF). Federation of Law Societies of Canada. 2003. Retrieved March 11, 2010. ^ Houghton Mifflin Company (September 28, 2005). The American Heritage guide to contemporary usage and style. Houghton Mifflin Harcourt. p. 185. ISBN 978-0-618-60499-9. ^ Barkwell, Lawrence J.; Leah Dorion; Darren Prefontaine (2001). Metis Legacy: A Historiography and Annotated Bibliography. Winnipeg, MB: Pemmican Publications Inc. and Saskatoon: Gabriel Dumont Institute. ISBN 978-1-894717-03-8. ^ "Indian and Northern Affairs Canada". Stage Three: Displacement and Assimilation. Government of Canada Web Archive-websites archived by Library and Archives Canada. February 8, 2006. Archived from the original on November 24, 2007. Retrieved October 3, 2009. ^ Branch, Government of Canada; Indigenous Northern Affairs Canada; Communications (February 8, 2006). "Report-Royal Commission on Aboriginal Peoples-Indian and Northern Affairs Canada". Volume 1, Part 1, Chapter 6 of the Report of the Royal Commission on Aboriginal Peoples. Archived from the original on November 15, 2007. Retrieved October 3, 2009. ^ a b "Gradual Civilization Act, 1857" (PDF). Government of Canada. Retrieved October 17, 2015. ^ a b c "Indian Act". Government of Canada. Archived from the original on February 16, 2013. ^ a b Armitage, Andrew (1995). Comparing the Policy of Aboriginal Assimilation: Australia, Canada, and New Zealand. Vancouver, Canada: University of British Columbia Press. pp. 77–78. ^ a b Dorsett, Shaunnagh (1995). "Civilisation and Cultivation: Colonial Policy and Indigenous Peoples in Canada and Australia". Griffith Law Review. 4 (2): 219. ^ a b Miller, J. R. (2000). Skyscrapers Hide the Heavens: A History of Indian-White Relations in Canada. Toronto, Canada: University of Toronto Press. p. 140. ^ Milloy, John (1999). A National Crime: The Canadian Government and the Residential School System, 1879 to 1986. Winnipeg, Canada: University of Manitoba Press. pp. 21–22. ^ Popic, Linda (2008). "Compensating Canada's 'Stolen Generations'". Journal of Aboriginal History (December 2007–January 2008): 14. ^ Charles, Grant; DeGane, Mike (2013). "Student-to-Student Abuse in the Indian Residential Schools in Canada: Setting the Stage for Further Understanding". Child & Youth Services. 34 (4). ^ a b Restoule, Jean-Paul (2002). "Seeing Ourselves. John Macionis and Nijole v. Benokraitis and Bruce Ravelli". Aboriginal Identity: The Need for Historical and Contextual Perspectives. Toronto, ON: Pearson/Prentice Hall. pp. 252 261. Retrieved October 28, 2009. ^ Unattributed (February 25, 2012). "Canada commission issues details abuse of native children". BBC. Retrieved February 25, 2012. ^ Benjoe, Kerry (June 12, 2008). "Group gathers for Harper's apology". The Leader-Post. Archived from the original on September 15, 2012. Retrieved October 2, 2009. ^ a b c Assembly of First Nations; Elizabeth II (2004). "The Indian Act of Canada – Origins: Legislation Concerning Canada's First Peoples". 1. Ottawa: Assembly of First Nations: 3. Retrieved January 11, 2015. ^ Mainville, Sara (June 1, 2007). "Lawsuits, treaty rights and the sacred balance". Toronto Star. Retrieved October 2, 2009. ^ "Treaty areas". Treasury Board of Canada Secretariat. Government of Canada. October 7, 2002. Archived from the original on August 22, 2007. Retrieved October 2, 2009. ^ "What is Treaty 8?". Canadian Broadcasting Corporation. Archived from the original on August 7, 2004. Retrieved October 5, 2009. ^ "The Indian Act" (PDF). Indian Act. Current to March 16, 2014. Department of Justice Canada. March 16, 2014. ^ a b c d e "First Nations, Bill C-31, Indian Act". Communications Branch. Department of Indian Affairs and Northern Development. Archived from the original on July 30, 2009. Retrieved October 2, 2009. ^ a b "Summary of the Final Report of The Royal Commission on Aboriginal" (PDF). CTV Canada. Archived from the original (PDF) on June 14, 2003. Retrieved October 5, 2009. ^ Alan Cairns (2000). Citizens plus: aboriginal peoples and the Canadian state. UBC Press. p. 116. ISBN 978-0-7748-0767-8. ^ Wanda D. McCaslin; University of Saskatchewan. Native Law Centre (July 2005). Justice as healing: indigenous ways. Living Justice Press. p. 27. ISBN 978-0-9721886-1-6. ^ "I- Aboriginal Health & Cultural Diversity Glossary, College of Nursing". University of Saskatchewan. 2003. Archived from the original on October 24, 2009. Retrieved October 2, 2009. ^ Jacklin, Kristen; Wayne Warry (2004). "14 Then Indian Health Transfer Policy in Canada: Toward Self-Determination or Cost Containment?" (digitized online by Google books). In Arachu Castro; Merrill Singer (eds.). Unhealthy health policy: a critical anthropological examination. Oxford United Kingdom: Rowman Altamira. p. 215. ISBN 978-0-7591-0510-2. Retrieved October 6, 2009. ^ "Indian Health Policy 1979" (php). About Health Canada > Branches & Agencies > First Nations & Inuit Health Branch. Health Canada. October 25, 2007. Retrieved October 2, 2009. ^ Lemchuk-Favel, Laurel (February 22, 1999). "Financing a First Nations and Inuit Integrated Health System A Discussion Document" (PDF). Heallth Canada. Archived from the original (PDF) on January 11, 2013. Retrieved October 2, 2009. ^ James Burgess Waldram; Ann Herring; T. Kue Young (July 30, 2006). Aboriginal health in Canada: historical, cultural, and epidemiological perspectives. University of Toronto Press. p. 85. ISBN 978-0-8020-8579-5. ^ a b c Price, Richard (1999). The Spirit of the Alberta Indian Treaties. University of Alberta Press > the University of Michigan. ISBN 978-0-88864-327-8. ^ "Post-war Rise of Political Organizations". Library and Archives Canada. Retrieved October 6, 2009. ^ "Diverse Peoples – Aboriginal Contributions and Inventions" (PDF). The Government of Manitoba. Retrieved October 17, 2009. ^ Newhouse, David. "Hidden in Plain Sight Aboriginal Contributions to Canada and Canadian Identity Creating a new Indian Problem" (PDF). Centre of Canadian Studies, University of Edinburgh. Archived from the original (PDF) on July 23, 2011. Retrieved October 17, 2009. ^ James F. Pendergast, Bruce G. Trigger (1978). Saint-Lawrence Iroquoians. Handbook of North American Indians. Volume 15. Smithsonian Institution. pp. 357–361. ISBN 978-0-16-004575-2. ^ a b "Aboriginal place names contribute to a rich tapestry". Indian and Northern Affairs Canada. Archived from the original on January 26, 2009. Retrieved October 17, 2009. ^ "History of Cub Scouting". Boy Scouts of America. Archived from the original on October 31, 2009. Retrieved October 17, 2009. ^ a b c Goddard, Ives, ed. (1996). Languages. Handbook of North American Indians. 17. W. C. Sturtevant. Washington, D. C.: Smithsonian Institution. ISBN 978-0-16-048774-3. ^ Searles, Edmund (2002). "Food and the Making of Modern Inuit Identities. Volume 10, Number January 1, 1 2002". Food & Foodways: History & Culture of Human Nourishment. pp. 55–78. ISBN 978-0-8061-2126-0. Although the Inuit of the Canadian Arctic have access to an ever-expanding market of different kinds of foods, they continue to invest considerable time and money obtaining Inuit foods, that is, foods hunted, fished, and gathered within the Inuit homeland. ^ "Vancouver 2010 Olympic Games Emblem". 2010 Olympic and Paralympic Winter Games. Archived from the original on October 25, 2009. Retrieved October 17, 2009. ^ "The First Nations-Communities: Reserves". The Literacy Community. Archived from the original on September 18, 2008. Retrieved October 5, 2009. ^ "Aboriginal languages". Statistics Canada. Retrieved October 5, 2009. ^ a b Gordon, Raymond G. Jr. (2005). Ethnologue: Languages of the world (15 ed.). Dallas, Texas: SIL International. ISBN 978-1-55671-159-6. Archived from the original (Web Version online by SIL International, formerly known as the Summer Institute of Linguistics) on October 12, 2009. Retrieved October 6, 2009. ^ "Nunavut's Languages". Office of the Languages Commissioner of Nunavut. Archived from the original on April 5, 2008. Retrieved October 2, 2009. ^ "Official Languages Act" (PDF). Legislation Division, Department of Justice. 1988. Archived from the original (PDF) on June 25, 2008. Retrieved October 2, 2009. ^ a b c Hessel, Ingo; Hessel, Dieter (1998). Inuit Art [An introduction. foreword by George Swinton]. London, UK: British Museum Press. ISBN 978-0-7141-2545-9. ^ "Aboriginal art in Canada". The Canadian Encyclopedia. Historica-Dominion. Retrieved November 27, 2013. ^ Andrew Hempstead (May 11, 2010). Moon Alberta: Including Banff, Jasper & the Canadian Rockies. Avalon Travel. p. 477. ISBN 978-1-59880-371-6. ^ a b "17 An Act to amend "The Indian Act, 1880". An Act further to amend "The Indian Act, 1880". 3 (47 Vict. ed.). S.C. 1884. Retrieved October 18, 2009. ^ a b Patterson, Nancy-Lou (1973). Canadian native art; arts and crafts of Canadian Indians and Eskimos. Don Mills, ON: Collier-Macmillan. ISBN 978-0-02-975610-2. ^ "Information First Nations Music in Canada". Indian and Northern Affairs Canada. Minister of Public Works and Government Services Canada. Archived from the original (PDF) on July 6, 2011. Retrieved May 13, 2013. ^ "Canadian Human Rights Commission :: Resources :: Frequently Asked Questions :: About Employment Equity". Canadian Human Rights Commission. Government of Canada. August 27, 2009. Archived from the original on September 27, 2007. Retrieved September 18, 2009. ^ "Classification of visible minority". Statistics Canada. Geovernment of Canada. July 25, 2008. Archived from the original on July 14, 2011. Retrieved September 18, 2009. ^ "Discrimination and Violence Against Indigenous people in Canada" (PDF). United Nations Committee on the Elimination of Racial Discrimination. Retrieved October 15, 2009. ^ a b "Aboriginal peoples of Canada: A demographic profile". Statistics Canada. 2001. Retrieved October 2, 2009. ^ "Social". Aboriginal Nationalism. Archived from the original on June 16, 2010. Retrieved October 15, 2009. ^ a b "Aboriginal peoples of Canada". Statistics Canada. Retrieved October 5, 2009. ^ "Aboriginal Governments and the Canadian Charter of Rights and Freedoms" (PDF). Kent McNeil. Royal Commission on Aboriginal Peoples, p. 73. 1996. Archived from the original (PDF) on July 6, 2011. Retrieved October 6, 2009. ^ "The Royal Proclamation". By The King George R. A Proclamation. Archived from the original on October 13, 2009. Retrieved October 6, 2009. ^ "Civilization.ca-Gateway to Aboriginal Heritage-Culture Areas Index". Canadian Museum of Civilization Corporation. Government of Canada. May 12, 2006. Archived from the original on October 20, 2009. Retrieved October 6, 2009. ^ a b Branch, Government of Canada; Indigenous and Northern Affairs Canada; Communications (November 21, 2008). "Urban Indigenous peoples". www.aadnc-aandc.gc.ca. Retrieved October 31, 2017. Jameson, John H. (1997). Presenting archaeology to the public: digging for truths. Rowman Altamira. ISBN 978-0-7619-8909-7. Olson, James Stuart; Pappas, Nicholas Charles (1994). An Ethnohistorical dictionary of the Russian and Soviet empires. Connecticut Greenwood Press. ISBN 978-0-313-27497-8. Taylor, Colin F. (2002). The American Indian. Running Press. ISBN 978-0-7624-1389-8. Ray, Arthur J. (1996). I Have Lived Here Since The World Began: An Illustrated History of Canada's Native People. Toronto, ON: Lester Publishing. ISBN 978-1-55263-633-6. Todd, Roy; Thornton, Martin; Collins, D. N. (2001). Aboriginal people and other Canadians: shaping new relationships. University of Ottawa Press. ISBN 978-0-7766-0541-8. Winchell, N.H. (1881). Ancient Copper Mines of Isle Royale. 19. New York: Popular Science Monthly. Asch, Michael (1998). Aboriginal and treaty rights in Canada : essays on law, equality, and respect for difference. University of British Columbia Press. ISBN 978-0-7748-0581-0. Beavon, D; Voyageur, C; Newhouse, D (2005). Hidden in plain sight: contributions of Aboriginal peoples to Canadian. University of Toronto Press. ISBN 978-0-8020-8800-0. Borrows, John (2002). Recovering Canada: the resurgence of Indigenous law. University of Toronto Press. ISBN 978-0-8020-3679-7. Cairns, Alan (2000). Citizens plus: aboriginal peoples and the Canadian state. University of British Columbia Press. ISBN 978-0-7748-0767-8. Cardinal, Tantoo (2004). Our story: Aboriginal voices on Canada's past. Doubleday Canada. ISBN 978-0-385-66075-4. Cavell, Edward (2009). Classic Images of Canada's First Nations: 1850–1920. Heritage House. ISBN 978-1-894974-64-6. Clark, Ella Elizabeth (October 5, 2011). Indian Legends of Canada. Random House Digital, Inc. ISBN 978-1-55199-512-0. Dickason, Olive Patricia (1992). Canada's first nations: a history of founding peoples from earliest times. University of Oklahoma Press. ISBN 978-0-8061-2438-4. Magocsi, Robert (2002). Aboriginal peoples of Canada: a short introduction. University of Toronto Press. ISBN 978-0-8020-3630-8. Nock, David; Haig-BroWN, Celia (2006). With good intentions : Euro-Canadian and Aboriginal relations in colonial Canada. University of British Columbia Press. ISBN 978-0-7748-1138-5. 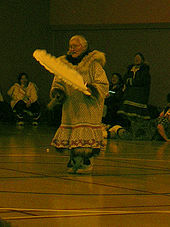 Wikimedia Commons has media related to Indigenous peoples in Canada. This page was last edited on 28 March 2019, at 03:15 (UTC).